Here we go again with a second consecutive awayday at Old Trafford. It is relatively rare these days to play the same team twice in successive matches as West Ham visit Old Trafford for the second time in four days. It was a more common phenomenon in the past where home and away fixtures against the same club were scheduled during the Christmas and Easter holidays or when drawn weekend cup matches were replayed on the following Tuesday or Wednesday. To the best of my knowledge West Ham meeting the same opponents in successive cup and league fixtures has occurred 5 times previously this century: January 2002 v Chelsea (Lost, Draw); April 2006 v Middlesbro (Lost, Won in FA Cup semi-final); December 2007 v Everton (Lost, Lost); January 2008 v Manchester City (Lost, Draw) and March 2011 v Stoke City (Won, Lost). History suggests that by not winning on Sunday we have given ourselves a better chance tonight. The head to head record is little changed since the weekend. Predicting lineups for League Cup games has become very difficult with selection contingent on how seriously the respective managers view the competition in the context of their overall season. It is a potential route into Europe; probably the most promising one for the Hammers while Mourinho’s hubris will ensure his mind remains confident of Champion’s League qualification. Diafro Sakho is back in the treatment room with a hamstring injury while Winston Reid is available again after a one match suspension. Once more an Andy Carroll return has been rumoured but my instinct is that the Arsenal game is a more realistic target for him. The alternating goalkeeper’s rule should mean Adrian between the sticks and I would guess at starts for Reid, Fernandes, Ayew and Fletcher. Pogba and Fellaini are suspended for Manchester United following their yellow cards in Sunday’s encounter. A first meeting of the season with referee Mike Jones from Chester. Jones was in charge of two West Ham away fixtures last season at Norwich (D 2-2) and Stoke (L 1-2). Jones has officiated 10 games this season issuing 36 yellow cards and 2 red ones – an impressive 9 of these yellows coming in last weekend’s Arsenal versus Bournemouth game. I know that the competition has had a number of names over the years according to the particular sponsors at the time, but to me it has always been the League Cup. The current title, the EFL Cup, sounds to me just like a trendy attempt to use initials to jazz up interest in, what, after all, is traditionally the minor competition in the English football calendar. I can never understand why so many clubs treat it comparatively flippantly, because in many ways it is the easiest of the trophies to win, and winning it is a passport into Europe for the following season. Clubs like ourselves, who were in Europe this season (albeit briefly in our case), received a bye into round 3, and by winning two home games against Accrington Stanley and Chelsea, now find ourselves in round 5, which is the quarter-finals. Get through this round and you are into a two-legged semi-final with the prospect of a trip to Wembley for the winner. Effectively you only have to beat five other clubs to land the trophy. Now I am old enough to remember the competition starting in 1960-61. It had a controversial beginning and some of the bigger clubs in the Football League didn’t even enter at first. And though it gained surprisingly more popularity than a lot thought it would, many teams even today use the early rounds in particular to give a run out to squad players who wouldn’t necessarily be first choice for Premier League games. From the outset of the competition we always fielded strong sides, and it is only comparatively recently that we haven’t gone flat out in the early rounds to try to progress. In 1960-61 the side we put out against Darlington was virtually identical to the team that had scored five goals in a Division One game just two days earlier, and the one that put six goals past Arsenal less than a fortnight later. Nevertheless we still managed an ignominious defeat at the hands of a lower division team (3-2), something we have managed to do consistently in our 56 attempts to win this competition. Throughout the years we have been beaten by football giants such as Rotherham, Huddersfield, Stockport (twice), Barnsley, Luton, Oldham (twice), Oxford, Crewe, Northampton, Chesterfield, Aldershot, Wigan, and most recently, Sheffield United. Nottingham Forest have eliminated us four times! We have been knocked out in Round One on one occasion, Round Two eleven times, Round Three nineteen times, and Round Four ten times. That means we have reached the quarter-final on 15 previous occasions, and our trip to Old Trafford is number 16. Of those 15, we have gone out at the quarter-final stage just six times, and progressed further in nine, which is a decent enough record. But in our nine semi-finals we have only reached the final twice, losing to West Brom in the last of the two-legged finals in 1965-66 (the following year the final was held at Wembley for the first time), and then in a replay to Liverpool in 1980-81, when we were a second tier team taking on the best club in England at the time. That was Liverpool’s first win of the League Cup trophy, but they have gone on to dominate since, and have won it the most times (8). Of all the players in our current squad, only Noble and Sakho had scored a goal in this competition in previous seasons. Noble scored in the two-legged semi-final in 2010-11 when we went out to Birmingham, and Sakho found the net when we were eliminated by Sheffield United on penalties the season before last. Of course, Payet, Kouyate and Fernandes have all notched a goal this time around. Players of yester-year, on the other hand, managed quite a few goals in League Cup games, with six reaching double figures, Cross and Goddard (12), Stewart (14), Byrne (15), Cottee (18), and Geoff Hurst the most prolific, notching 43 goals in just 47 League Cup appearances. However, I’ll always remember the penalty Geoff Hurst had saved by Gordon Banks in the final minutes of the semi-final second leg against Stoke in 1971-72. If that had gone in we would have been through to the final (probably). As it was, in the days before penalty shoot-outs, that epic semi-final tie took four games to settle before we lost 3-2 in the dramatic second replay, even though Bobby Moore saved a penalty when taking over in goal from the injured Ferguson (no substitute keepers in those days!). This is only the third time we have ever faced Manchester United in the League Cup. In our record breaking season of 1985-86, they knocked us out 1-0 in Round 3, whereas on 30 November 2010 (exactly six years ago today, when it was called the Carling Cup) we famously beat them 4-0 in the quarter-final on a freezing night at Upton Park, with a brace apiece for Jonathan Spector and Carlton Cole. It is 22 years since we last lost a game on the final day of November. Since then we’ve won three and drawn one, with 10 goals scored and only two conceded. And who can ever forget November 30 1988, when we famously put four past Liverpool in a League Cup fourth round game? It would be great to progress to another semi-final, and then we could even begin to dream of another trip to Wembley. Manchester United are not the force of old, and I am looking forward to us repeating our promising visit there last Sunday, but this time returning with a victory. Trying to make sense of the encouraging improvement at Old Trafford. Taking everything into account the performance on Sunday was a pleasing one. Manchester United may not be the greatest team at the moment but they have a squad of very talented (and expensive) players. Whether Mourinho can mould them into a great team remains to be seen. West Ham gave a good account of themselves and were ahead before a Manchester player had taken a meaningful touch of the ball. The fatalist in me felt that we had scored too early and when Ibrahimović was allowed a soft equaliser it was easy to imagine the floodgates opening. But we stuck to the task and despite their dominance of possession were restricted to a few cut and dried goal-scoring opportunities. Some fine performances where my standout players were Randolph, Kouyate, Obiang, Payet and Sakho. Yet again Obiang was excellent and the delay in him being given the chance to secure a regular start leaves me scratching my head. Football reporting is largely presented in black and white terms with a narrative that big club should beat little club and if they don’t it is because of big club’s shortcomings rather than the small club’s skill, resilience or determination. Allied to this there is the concept of the ‘deserved result’ which has been debated on social media in the aftermath of our game. MOTD pundits Martin Keown and Trevor Sinclair had declared the result a fair one while Twittering Robbie Savage disagreed stating that the outcome was due solely to Manchester’s wastefulness in front of goal. The Mourinho spin for Manchester United’s mid table position is that they are the unluckiest team in the history of the game. There could be a case to argue if incorrect refereeing decisions kept going against you (as they did with West Ham last season) that you have been the victim of misfortune; but if it is simply your players not being able to do there job effectively (e.g. by converting goal-scoring opportunities) then this is a reflection of ability or coaching rather than luck. As Mourinho seems to believe that every decision given against his team is an incorrect one then he will never be able to accept that he gets what he deserves. Leicester won the league last year in a manner where they invariably had less possession than the opposition during games. A misinterpretation of this statistic might lead the foolish coach to instruct his side to lose possession as soon as possible in order to improve the chances of winning the game. It would be a comical tactic and yet our attempts at keeping the ball frequently appear as if this is something we strive for. It is difficult to decide if this sorry state is due to poor technique and decision making by the passer or insufficient movement in providing options by potential receivers. Perhaps I view West Ham through a more critical lens but I don’t believe any other Premier League side has such difficulty in ball retention or ends up playing it back to the keeper so often. It is one thing to use the keeper under pressure but not because you have run out of ideas. Experience tells us that it is rare for a punt up field from the keeper, or even a central defender for that matter, leading to anything constructive. If we are going to pick up the points we need from games against the less glamorous clubs (an issue both this and last season) then we have to greatly improve ball retention. It had been an encouraging return for Diafra Sakho up until his latest injury setback and he finally provided an opportunity to celebrate a goal from a striker when he headed home Dimitri Payet’s free kick. The striker situation at West Ham has been a perplexing one where the supposed no-stone-unturned search for a goal scoring forward has been confounded by not having a clear profile of the type of player sought. Our current style of play is based upon one up front and in the modern game that ‘one’ needs to have pace, energy, strength and mobility. Sakho is by far our best option for this role at the moment. If we are really on the lookout for reinforcement up front it needs someone with his attributes but with a more reliable fitness and goal scoring record. It is difficult to see how an Andy Carroll fits into such a system; it brings with it a far more predictable style of play and for optimum effectiveness requires the presence of a second striker to pick up the pieces. This is precisely the reason why Benteke was seen as surplus to requirements at Liverpool given the fluid style now being successfully employed by Klopp; and it was very worrying to hear Bilic say that he was an admirer of the Belgian. As for Sakho it was impossible to tell from his demeanour if fences have been mended and he is now back committed to the West Ham cause or whether his efforts were an advertisement to potential suitors. There is a saying that ‘good is the enemy of great’. It alludes to the fact that people are often prepared to accept competence rather than always working harder and striving for better. We are good, we are not the worst, what is there to worry about? 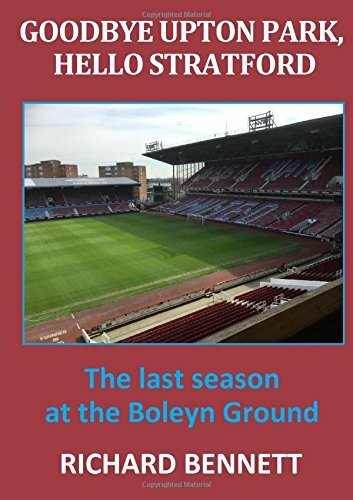 It is a state of mind long associated with West Ham particularly as the self-styled family club more at home with ex-players in the dugout and local lads on the pitch. A number of times in our history we have been on the verge of great but decided to stick. In some ways it is admirable to display loyalty but is not a good fit with success in the modern game where sentiment is a thing of the past. This is how I view the Mark Noble situation. He is a good player but could never be great due to several significant limitations. I don’t dislike him in any way (and have always loved his passion and commitment) but those limitations are becoming more apparent the more intense the game becomes. I would love him to prove me wrong but, on current form, he is very fortunate to get a starting berth; local lad or not. Re-living some special League Cup memories from the week 28 November to 4 December. This week we are going to gloss over a 7-0 defeat at Hillsborough by Sheffield Wednesday in 1959 and a 5-2 reverse at Tranmere in 1992 to focus our attention on famous League Cup exploits that have taken place between 28 November and 4 December in Hammer’s history. It’s your own cut out and keep League Cup supplement. The 1980/81 season was one of the most memorable and successful ever for the Hammers. Although consigned to the second division at the time West Ham boasted a top flight team and were well on course for promotion when they came up against Tottenham in a quarter final tie on a frosty evening in early December. West Ham had won each or their last 13 home games and after a slow start to the match began to get the better of their close neighbours whose lineup included Hoddle, Ardiles and Villa. With less than 10 minutes left and still scoreless Brooking was put through on goal but his shot was blocked by out-rushing keeper Barry Daines in the Spurs goal. The ball broke loose to the right hand side of the penalty area where running away from goal David Cross chipped the ball delightfully in at the far post to score his 21st goal of the season. Cue pandemonium and one more famous victory over the north Londoners. On 30 November 1988, second from bottom West Ham entertained high flying current champions Liverpool at Upton Park in a 4th round tie. It turned out to be another memorable occasion under the floodlights and, in particular, for Paul Ince who scored two first half goals (an excellent volley and a deft header) to set the Hammers on their way. Liverpool pulled one back from the penalty spot (how else could they beat Allen McKnight) before half time but a bizarre Steve Staunton headed own goal restored West Ham’s two goal advantage. The scoring was then completed courtesy of a Tony Gale Payet-esque free kick that had been awarded after Nigel Spackman tried to remove Julian Dicks head with his boot. The Hammers securing an unlikely 4-1 victory on the night. On the very same day but 22 years later it was top versus bottom as Manchester United were the visitors to Upton Park for a 5th round tie against Avram Grant’s erratic side. Manchester United were the holders of the then Carling Cup and came into the match unbeaten in domestic competition that season and off the back of a 7-1 annihilation of Blackburn Rovers the previous weekend. The match was played in what journalists like to call ‘arctic conditions’ and after some early scares Super Jonny Spector took centre stage to notch a first half brace (the American’s first goals in English football) against his former club. In the second half two well take goals from Carlton Cole made it a wonderful 4-0 humiliation of Sir Alex Ferguson’s side and leaving Sir Alex even more red in the face than usual through embarrassment and cold. So maybe 30 November is an auspicious date for successful League Cup encounters as we prepare for episode two of the Old Trafford series on Wednesday. Just bear in mind that West Ham were relegated in both the 1988/89 and 2010/11 seasons. A more personal memory was one where I failed to observe my unwritten rule of never attending matches with supporters of the opposing team. This was in November 2000 when I took two work colleagues from Sheffield to watch second division Wednesday play West Ham at Upton Park. This was the first home game after the sale of Rio to Leeds and featured the debut of cut-price replacement Rigobert Song. With Di Canio in full flow against his former employers we started as if we were going to murder them but the footballing gods had other ideas and we lost the game 2-1 to prompt much mickey-taking. And it’s live!………. Not it’s not! After spending a pleasant late autumnal Sunday afternoon doing some of those jobs in the garden that need to be done at this time of year, I was looking forward to listening to the radio commentary of our game at Old Trafford. So I came indoors shortly before 4.30 p.m., took my seat in the lounge, and switched on the TV and tuned to Sky. I was going to watch the Southampton v Everton game “live” on Sky with the sound turned down, whilst simultaneously listening to our game on the radio on my i-pad. I tuned into the normal radio stations, Five Live and Talk Sport, and was surprised that our game wasn’t on either of them. As I was searching for Radio London, who I discovered were actually broadcasting our game, I was initially listening to the commentary of the Southampton game, and heard Charlie Austin scoring a goal in the first minute. Looking up at the TV screen to see the goal I noticed that the players were still in the tunnel! Then as the players were coming onto the field I heard the commentator telling us they were going to a break, and suggesting that we stay tuned to Sky for the game, finishing with the words “and it’s live”. Well according to the radio the game was already well underway. By the time they kicked off on TV, the game had been going for more than five minutes. The top right hand corner of the screen had the word “live”. How can Sky get away with this? Anyway, back to the radio commentary. Whilst still waiting for Radio London to kick in on my i-pad, I heard the dreaded words from the commentator at Southampton, “goal at Old Trafford.” Oh no, how can we have conceded this early? As they went over to the reporter at our game, I was pleasantly surprised to hear that we had, in fact, taken the lead. What is more, one of our forwards, Sakho, had scored the goal. This was the first goal scored by a West Ham forward since last May when Sakho opened the scoring in the thrilling last game at Upton Park. It was his third goal against United in four games and his second at Old Trafford. Apparently it was also the second quickest goal that United have ever conceded at home in the Premier League. I listened as the half wore on and we seemed to be playing quite well. Then, once more, according to the commentator, we conceded a goal because of a defensive mistake. How can we keep doing this? Then, yet another surprise (not)! A Pogba dive after Mark Noble hadn’t touched him, and United’s costliest ever player was booked for simulation. Mourinho did his pieces on the touchline, kicking a water bottle, and was sent off by referee, Moss. If I remember correctly Moss was the referee who sent Mourinho to the stands when we beat Chelsea 2-1 at Upton Park a little over a year ago. By all accounts we were well worth the draw, despite United doing more attacking and having greater possession, but you would expect this at Old Trafford. Darren Randolph vindicated his selection in goal with some magnificent saves. I look forward to watching the game later on Match of the Day 2. At the end of the match I had a look at the league table, and had a few “if only” thoughts. How many points would we have had at this stage of the season if we had held on to win games that we were winning? How many points have we dropped? Watford (3 points), Stoke (2 points), Tottenham (3 points), and Man United (2 points). Three of those four games have been in the last three matches we have played. And how many points have we retrieved from a losing position? Just one I think, from the Middlesbrough game. So despite having what most people would describe as a poor season, the loss of points from a winning position has been crucial. With those ten points we would now be sitting in fifth place in the league with 22 points. Tottenham would be sixth with 21, and Man United seventh with 19. It is no good really looking back and saying “if only” because we can’t change history and what has happened. It makes you think though. We still have two tough games to come against Arsenal and Liverpool, before a run of four easier (on paper) games to take us up to the end of 2016, and the half way point in the season. Although we have risen to sixteenth in the table, we are still only one point above the drop zone. Every game is vital of course, but the next six games are critical. The table is very compact with only nine points separating Man United in sixth and Hull in eighteenth. Even Swansea and Sunderland have not been tailed off after their recent improved results. Thirteen league games played now (and only five of them were Saturday 3pm kick offs!) Next Saturday’s game at home to Arsenal is at 5.30 pm, adding to the proportion of games played at a non-traditional time. Now that we have no more international breaks for a while, the games will come thick and fast with the EFL cup quarter final on Wednesday, followed by the six league games mentioned above all taking place in December. Wednesday’s game is “live” on TV. Well they say live but …………. Is there to be any relief for the beleaguered Hammers and their manager at Old Trafford this afternoon? The West Ham fixture list of death rolls onto Old Trafford today for the first of two games in a week against Manchester United; a Premier League clash followed by the League Cup quarter final tie on Wednesday. When points are at a premium any old straw is suitable for clutching and a Sunday game against opponents recovering from Thursday night European action can offer a glimmer of hope. Disappointingly this was no many thousand mile round-trip to an outpost in far-eastern Europe and a bruising encounter with uncompromising opposition but a stroll in the park at home against Feyenoord. In many ways the worst possible result for West Ham’s hopes that will give an unconvincing Manchester side renewed sense confidence before returning to today’s league action. The Hammers on the other hand have had a whole week to dwell on the late, late surrender of three points at White Hart Lane last weekend. There were some positives to take from the Tottenham game even if there was no reward at the end of it. As a minimum we need to see the same level of intensity, organisation, pace and energy that was shown for much of last week’s performance. Otherwise it is likely to end up as just another frustrating and barren trip to this particular north-west graveyard of dreams. Playing two games at Old Trafford in four days the chances of getting something from both would look to be very slim. In different circumstances I might be happy to trade defeat today for victory in the cup clash but the desperation for points, in a game where an 8-0 defeat would see the Hammers drop into the bottom 3, leaves the league game as the top priority. Although West Ham’s record at Old Trafford is quite poor it is nowhere near as unprofitable as visits to Anfield have been and there have been some notable victories over the years; the most recent being the Tevez match on the last day of the 2006/07 great escape season. Before that there were two wins at either end of 2001 including the famous PDC/ Barthez goal, a memorable victory in the opening week of the 1986/87 season and exactly 40 years ago today West Ham ran out 2-0 victors with goals from Trevor Brooking and Billy Jennings. Winston Reid is suspended following the late sending off at White Hart Lane and there is a rumour that Andy Carroll is fit, although this is likely to be more of that fake news that we have been hearing about lately. Of course, Andy is our joint top scoring striker with 0 goals to his name and so the bar is not set too high for his return. I imagine that Sakho will start up front again following his energetic performance last week and maybe Carroll will be on the bench with Fletcher. It will be very disappointing if West Ham have bothered to pay Zaza’s train fare up to Manchester as surely even the most blind optimist knows by now that he is a lost cause; it makes absolutely no sense whatsoever to continue to involve him. With no right back available it is probable that the 3 at the back experiment will persist with Collins coming in for Reid and meaning that Antonio’s defending will open again to scrutiny this time by Mourinho’s men. One of the positives from last Saturday was the speed with which we broke but that is all likely to change with the re-introduction of skipper Mark ‘Sideways’ Noble into the midfield. Bailly and Smalling are out for Manchester United who otherwise have no further injury or suspension concerns. Wayne Rooney requires two more goals to overtake fellow baldy Bobby Charlton as all-time Manchester United top scorer and who better than West Ham to oblige in such circumstances. The referee today is Jonathan “Jon” Moss from West Yorkshire (why do so many referees seem to come from Yorkshire?). This is West Ham’s second encounter with Mr Moss this season; the first being the 3-0 home defeat by Southampton in September. Moss has officiated is 12 games so far this season issuing 57 yellow cards and 2 reds. Guaranteed that he will award Manchester United a penalty today (probably for some Ogbonna grappling). I Wouldn’t Bet On It 18 – So near and yet …. Looking to plunder some profit from the visit to Old Trafford. Total stake = 20 points, reducing our balance to 81. If the score had stayed the same as it was at half time then our return would have been over 150 points. If the score had stayed the same as it was after 88 minutes then we would have had a return of 49.5 points. The odds on a Tottenham victory after 88 minutes would have been massive. Even if the game had ended 2-2 we would still have shown a profit on the day. But the madness of those last few minutes not only cost us three points, but it cost us what would have been an excellent return on our gamble. It was not to be – if we had been participating in the in-play market then a late cash-out would have been advisable. This week we’ll have some fun on our game at Manchester United. We had a good run for our money at Tottenham and will aim for a similar run and hopefully, profit, at Old Trafford. If we lose the game then we are 30 points down on the day, and our balance will fall to 51 points. If we draw or win the game then we are up on the day. With the right score and goalscorer then our profit could be greater. And in the extremely unlikely event that it is 0-0 at half time, and then Obiang scores and we win the game 1-0, then our return would be 570 points. It’s all a bit of fun and adds interest to the game. I fancy we’ll get something out of the game, even if the bookies don’t think so.